TeamMates is a strengths-based mentoring program, equipping mentors to help students discover their individual strengths and talents and identifying opportunities for them to build on the ways that they are uniquely awesome. Data collected through the Gallup Strengths project has demonstrated that this strengths-based approach produces a positive impact on students’ levels of hope, engagement in school, and well-being. As a result, TeamMates mentees look forward to meeting with their mentor each week and have the support and encouragement they need to reach their full potential. 54 percent of TeamMates mentees saw an increase in their course performance. 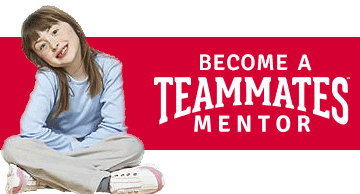 TeamMates+, started in 2012, provides additional support for high school mentor-mentee matches and is designed to assist students in graduating from high school, developing a plan for post-secondary education or training, and equipping them with the skills necessary to carry out that plan. Due in part to TeamMates+, the number of mentees graduating with the support of a TeamMates mentor has increased from 150 in 2014 to nearly 600 in 2016! Post-secondary education and training is expensive and TeamMates is working to ease the burden of continuing education for our mentees. Through the generosity of donors and partnerships with community colleges and universities throughout Nebraska, Iowa, Kansas, and Missouri, TeamMates provides approximately 30% of mentees with a scholarship to the school of their choice. In 2016, mentees were offered over $1.6 million in funding to help them achieve their dream of a college degree. Many students struggle during the transition from high school to college. Recognizing those challenges, TeamMates created the Post-Secondary Program in 2012 to continue providing the support of a mentor to mentees at the post-secondary level. Now, over 90 percent of TeamMates post-secondary mentees persist to their second year of college, 20 percent higher than the national average. To learn more about bringing the support and encouragement of mentors to students in your school, check out Start a Chapter!